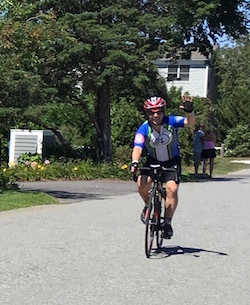 Thanks to the support of my generous domain name industry friends and colleagues, I went into this year’s Pan-Mass Challenge (PMC) ride having already hit my fundraising goal. As I have mentioned over the last several months, my wife and I support Dana-Farber Cancer Institute and its mission, and seeing friends and colleagues donate to help their efforts is very meaningful to me. Your support now would still be appreciated!! For those of you who have never participated in the Pan-Mass Challenge before, I want to share a recap of the ride and experience with you. For those who are thinking about doing the PMC in the future, I shared a few tips at the end of the article. There are several PMC routes from which to choose, and I did the Wellesley to Provincetown (163 mile) route. For the previous two years, I did the Wellesley to Wellesley 50 mile route. 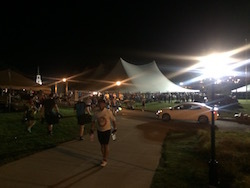 For me and a couple thousand other cyclists, PMC weekend started off at Babson College in Wellesley, Massachusetts early on Saturday morning. 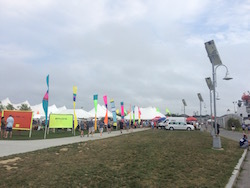 There was a huge tent for registration and breakfast filled with thousands of riders and hundreds of volunteers. For the entire weekend, there are just over 6,000 riders, many of whom started in Sturbridge for the 192-mile ride. I know how much the ride means to Dana-Farber and its patients, but the first time it really hit me during the weekend was when I saw a young rider who had a message on the back of her shirt that said something like “brain tumor survivor.” The impact of Dana-Farber is far-reaching and strong. After stretching, a couple of short speeches, and the national anthem, we were off for the first day, which was an 84 mile ride for my route. The first neat aspect of the ride was seeing Boston Red Sox executive and Jimmy Fund Chairman Larry Lucchino cheering on the cyclists, including his wife, Stacey, who rides on the Red Sox-sponsored Team 9 (named in honor of Ted Williams). Sidenote: As a Red Sox fan and season ticket holder, I would love to ride on Team 9, but I think you have to be affiliated with the Sox to be on their team. On the first day, we spent most of our time riding through some of the smaller towns on the way to our first stop at Massachusetts Maritime Academy (MMA). Despite our early departure, there were a ton of people on the road cheering for us. People had handmade or printed signs showing their support for riders in general as well as for teams of riders. There were also PMC balloons on mailboxes throughout the route. I wish I could have taken photos because it was really cool to see their signs. Throughout the ride, people were saying “thank you” to the riders. It felt strange hearing that because it was those people who helped give me encouragement to keep on pedaling. At various parts of the ride, people were handing out water bottles, lollipops, ice pops, Twizzlers, and other snacks for riders. I can’t stress how much this support meant along the way. We also saw people holding signs that said things like “I am 11 thanks to you” and “Cancer survivor for 20 years.” It was a great feeling to see how much Dana-Farber helps and to know that we are helping Dana-Farber. One of the most meaningful aspects of the ride came during the third water stop of the day. This was the “Pedal Partner” stop where teams met up with their pedal partner, children who are undergoing treatment at Dana-Farber (patients at the Jimmy Fund Clinic). For approximately one mile before the stop, there were large posters with photos of the Pedal Partners and their names. These are the people we are riding to help. I did not have a Pedal Partner this year, and I couldn’t help but think how lucky my wife and I are to have two healthy kids. I can’t even imagine what parents of kids with cancer are going through. After working our way through Massachusetts, the Wellesley and Provincetown riders stop in Bourne for the evening, where the Massachusetts Maritime Academy plays host. The MMA is the perfect spot for a layover. Not only is it about halfway to P-town, but the facilities and campus are beautifully maintained. People have the option to stay in the MMA dorms, on a large MMA boat, or in tents outside on the campus. Others choose to stay elsewhere on their own. I chose the dorm, and although it was a bit reminiscent of my college days, it wasn’t bad at all. Although I have been consistently training in the 15 MPH range on my bike, I ended up doing the ride at an average pace of 16.2 MPH. I wanted to beat the heat and arrive in time to get a massage. Luckily, I arrived in time to get a great massage from two Northeastern PT students. At the MMA, there is another huge tent serving BBQ all afternoon and evening. Dunkin Donuts gave out free drinks, Harpoon gave away a ton of beer, Yuengling gave out ice cream, and several other companies were there to support riders. I don’t think I have ever seen as much Poland Springs water as I saw this weekend. There were also quite a few bike shops helping riders, including Landry’s, which is where I bought my bike (Trek Domane) in October. On Sunday morning, we were up super early. I set my alarm for 4am, but there were people who woke up even earlier. There were huge tables of breakfast foods with pretty much anything a bike rider would want to have for breakfast before a big ride. As it got close to 5am, people were already getting on their bicycles and meeting up with teams. I took my time to give my wife a bit more time to drive to P-town with the kids. I had to balance my desire to get on the road to avoid the late morning heat with the 3 hour drive my wife had to make when the kids woke up. Day two is a 79 mile ride, and I figured it would take longer because of tired legs and some of the hills. I hit the road at about 5:20, and although I was initially a bit concerned with the Bourne Bridge incline, it didn’t turn out to be so bad. Riders went up steadily, and even at 5:30, there were people cheering for us. We spent quite a bit of time on the Cape Cod Canal Bikeway, which was quite beautiful in the morning. Throughout the morning on Sunday, we rode on and off Rte 6, a highway that goes through Cape Cod. We spent time riding through various town on the Cape, and at each intersection, there were helpful police officers and volunteers holding traffic for us. Just like on Saturday, there were people holding signs and offering encouragement throughout the ride. I had never been through many of the towns, and it was great to ride there. Interestingly, Wellfleet.com just sold on NameJet last week (I was an underbidder) and Wellfleet was one of the water stops. From a riding perspective, I think the most challenging aspect for me was the last 20 miles or so. There is a fairly long climb in Truro, although the people cheering us on were helpful. The last several miles of the ride were spent on Rt. 6. Drivers gave us enough room, which made that aspect more comfortable. A couple of people had warned me about the long (but slight) incline and headwind, but it wasn’t as bad as I imagined. I chose to take the 2 mile longer route through the Provincetown dunes, and that had a few rolling hills. By that point, the temperature was the biggest obstacle for me. I chose to finish my ride at the Provincetown Family Finish so my wife and kids could watch. Traffic was slightly tricky for them, but they quickly found parking and were able to cheer for me as I crossed the finish line. Although the PMC was not an Olympic-level athletic accomplishment, it felt great to finish. I would be remiss if I didn’t mention the awesome PMC volunteers of all ages. At each stop during the ride and at many points on the route, there were a ton of people volunteering to support the riders and PMC staff. We certainly would not have been able to do this if it wasn’t for the volunteers who spent their time helping us. My goal is to keep riding each year until I can’t do it any longer. If I can’t ride for some reason, I plan to be a volunteer to do whatever is needed to support the riders. This weekend was amazing, and the support from friends and colleagues before and during the event was fantastic. Although my $10,000 fundraising goal was already met, your helping me support Dana-Farber would still be appreciated! Apparently, I am less than $600 away from finishing in the top 10% of all fundraisers, and it would be really special to hit the $11,600 number. Overall, PMC 2016 was a very meaningful weekend. We raised a lot of funds for Dana-Farber Cancer Institute, and we saw how impactful Dana-Farber is on the people who live in the area. It was great to meet my fellow riders, and it was an experience I hope to re-live each year. In case you are interested in riding in the Pan-Mass Challenge, I want to share some tips. Follow the PMC training guide as best as you can. When I started training, I didn’t know how I would be able to do this ride. After training for a couple of months using the guide, I knew I could do it. I felt strong after both days and I attribute it to the training I did before the ride. If you are staying in the MMA dorms, bring a small fan. The rooms are very warm, and the buzzing fan may help you sleep. Someone suggested this to me before the ride, and it was very helpful. The medical stations not only have things like Ibuprofen and Band Aids, but they also have sunscreen. I brought my own, but it’s good to know this is available. If you plan to leave early on Sunday, make sure you have a light on your bike and/or helmet since it is still dark at 5am. Fill up bottles at the water stations, especially on Sunday. To me, it seemed like there were fewer people offering water on Sunday and there is one fewer water stop. That said, there were more unofficial team stops on Sunday, and I am sure they would be happy to share water if needed. Try to get fundraising done before the ride so you don’t have to worry about that when the ride is done. Congrats Elliot- job well done! It is awesome that you ride for such a great cause. Nice work Elliot! Such a fantastic cause, I look forward to seeing you race next year too! Great work for a great cause. Thanks for the summary, Elliot. Great job Elliot and such hard work preparing. Great account of your ride Elliot – really gives us some insight into what is involved – that ride is certainly no walk in the park! 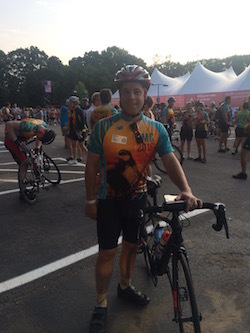 Congrats on getting through the training regimen, completing the ride, hitting your fundraising goal and helping so many people through you efforts. Outstanding in every way! Great job and nice way to make a difference in the lives of others! Eliot, I enjoyed your story. The PMC is indeed a special opportunity to help a great cause that has brought comfort and healing to so many. Next year I hope you’ll start from Sturbridge and you will have another story to write. Even better join me and Team Kermit on our Day Zero ride from Newton to Sturbridge. Let me know if you’re interested.